In September of 1620, 102 passengers boarded the ship, the Mayflower. Some of these passengers were seeking religious freedom, others were hopeful for opportunity of land ownership in the New World. The journey lasted an unbearable 66 days and the Mayflower sunk its anchor near the tip of Cape Cod. This was different from the original plan to land near the mouth of the Hudson River. One month later, the Mayflower crossed the Massachusetts Bay, and this is where the Pilgrims established their village at Plymouth. Only half of the Pilgrims made it through the treacherous winter to see a New England Spring. In March, the settlers moved ashore and were greeted in English by an Abenaki Indian. The pilgrims were amazed. A few days later, he returned with Squanto of the Pawtuxet tribe. Squanto, who had been kidnapped by an English sea captain, was sold to slavery in Spain and later escaped back home. In his lifetime he had crossed the Atlantic six times. He also spoke English. It has been told that because of Squanto, the Pilgrims were able to survive. He taught them how to grow corn, catch fish, extract sap from maple trees, and avoid poisonous plants. He also helped to nourish a relationship between the Pilgrims and the Wampanoag Tribe. The friendship between the Pilgrims and the Wampanoag tribe lasted for over fifty years. This is sadly one of the only examples of peace between the Pilgrims and those indigenous to this land. In November of 1621, corn was harvested and Squanto's teaching techniques proved to be a success. The Pilgrims decided to celebrate the first harvest, and Governor William Bradford invited Chief Massasoit and the Wampanoag tribe. This festival lasted for three days and it is now considered America's first Thanksgiving. There is much controversy over the story of Thanksgiving, and the holiday itself. Many scholars and historians argue that the Feast in 1621 was not the first one. For example, in 1565 Spanish explorer Pedro Menendez de Avile invited members of the Timucua tribe to dinner in St. Augustine, Florida after his settlers had arrived. They hosted the dinner after a mass filled with prayers of gratitude for arriving safely to the New World. In 1619, 38 British settlers arrived at the James River in Virginia and also gave thanks for a safe journey. The other and most serious controversy is that of the relationship between the Pilgrims and the Native Americans. Many believe that the story of Thanksgiving paints a pretty and naïve picture of a gruesome and horrific story. The fact is that thousands and thousands of Native Americans were killed and died after the arrival of the Pilgrims. That being said, the practice of "Thanksgiving" has existed for centuries. 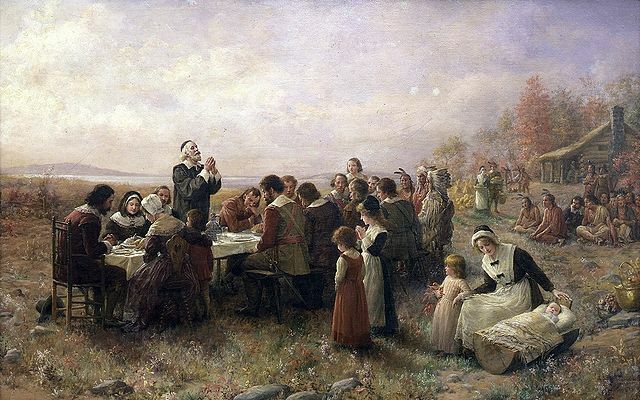 The European Separatists and Puritan Settlers observed fasting in tough times and feasting in times of good fortune. The ancient Greeks, Romans, and Egyptians all paid tribute to gods after the Fall Harvest. Thanksgiving is similar to the Jewish Festival of Sukkot. Long before the arrival of the Pilgrims, Native Americans started the Fall Harvest with feasts and celebration. Many people view Thanksgiving as one of the most beloved holidays of the year. Thanksgiving can be seen as a time to express gratitude for all that we have and cherish the time spent with friends and family, all while honoring and remembering the history that came before us. The day after Thanksgiving is considered to be one of the busiest shopping days of the year as most retailers provide some sort of a sale or special deal. Why not visit the Mall of America – the largest shopping mall in America in Bloomington, MN? Don't forget to share your Thanksgiving experiences with us on social media using the hashtag #IEXculture!